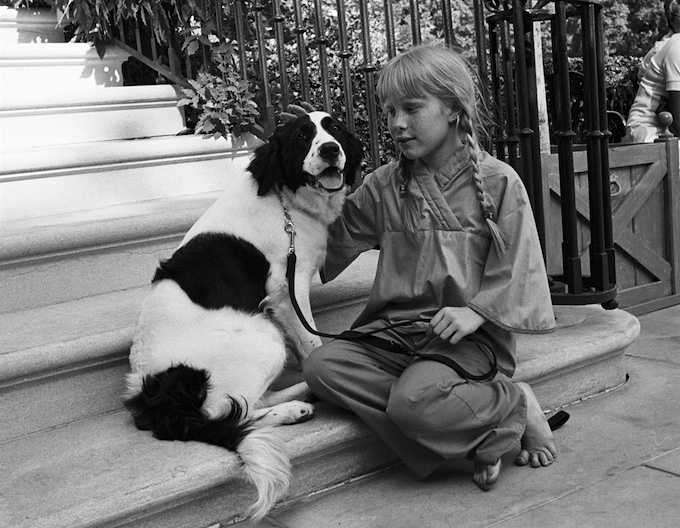 Amy Carter and her border collie mix, Grits, on June 9, 1977. When Jimmy Carter and his family moved into the White House in 1977, they did not bring any dogs with them. His daughter Amy Carter’s public school teacher, Verona Meeder, tried to rectify that situation by giving 9-year-old Amy a handsome border collie mix. The dog, who was born on the same day Jimmy Carter won the presidential election, was named Grits in honor of the Carter family’s Southern roots. Grits’ arrival at the White House is recorded in the presidential diary on June 8, 1977. Amy “sure loves that dog,” visitors were said to observe. 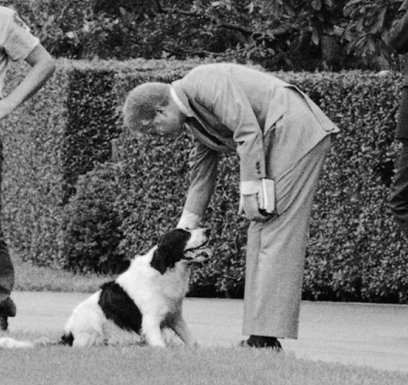 Several photos show that Grits was part of the family — including one showing Amy petting Grits on the White House steps and another that shows the president bending to pet the black-and-white dog outside the White House — until the Carters apparently decided to give the dog back to Amy’s teacher. President Carter pets Grits the dog. Some sources report that Grits had a few behavior problems, including soiling the White House carpet and refusing to swallow a pill for Heartworm Awareness Week — not to mention Grits apparently didn’t get along very well with the Carters’ cat, Misty Malarky Ying Yang. But it may be that Amy parted with Grits to help ease her teacher’s sadness over the loss of her own dog. First Lady Roslaynn Carter’s press secretary Mary Finch Hoyt told the Associated Press in an article dated Sept. 11, 1979 that when Meeder’s dog — who was Grits’ mother — died, Amy, who was by then 11, gave Grits back to her teacher.